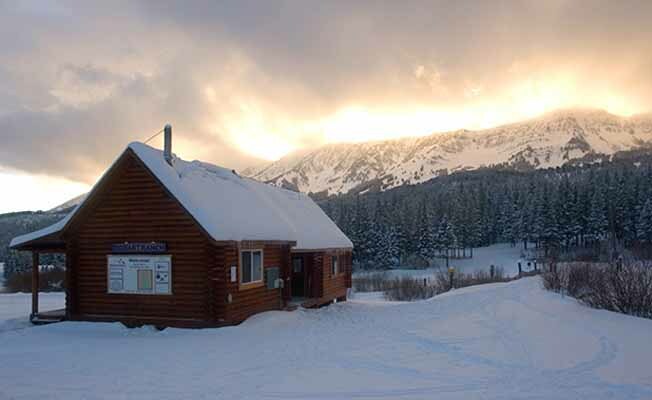 A feeling of the Old West awaits the Nordic Skier at Bohart Ranch Cross Country Ski Center located in the Bridger Mountains 16 miles north of Bozeman. The Ski Shop is open from December through March and offers quality ski rental equipment for classic and skate skiers of all ages as well as snowshoe rental. The Ski School is staffed with qualified instructors who teach daily lessons to all age and ability levels. Our day use facility includes a warming lodge where snacks and drinks may be purchased. Bohart Ranch is dedicated to offering the highest quality of Nordic skiing and 29KM of trails are professionally groomed daily. Skiers experience scenic solitude and are often treated to wildlife sightings on the trails that loop through terrain suited to all ability levels. The Kiddy Kilometer Trail is a signed interpretative trail popular with families and younger skiers. The Biathlon Range offers year-round training and competition. We also have signed snowshoe trails. Visit our web site: www.bohartranchxcski.com for a listing of many special events such as citizen races and moonlight ski and snowshoe outings. Enjoy summer at Bohart Ranch from mid-June through October. Trails are open for hiking, running, mountain biking, horseback riding, Frisbee Golf and Summer Biathlon. Bohart is available as a venue for outdoor weddings, business meetings or retreats, family reunions and special events.